Romance was in the air here at the Inn Above Onion Creek over the weekend. A beautiful young couple got married under majestic oaks trees here at the Inn. 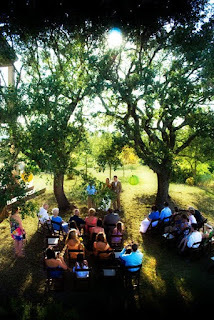 The couple had stayed at the Inn before and thought it would be the prefect setting for a Texas hill country wedding. 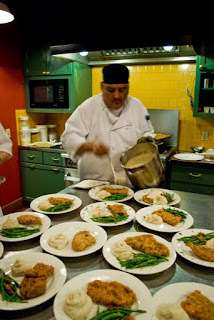 Sticking with the rustic theme they had Chef Adrian prepare a Chicken Fried Steak Wedding Dinner. Our chef can create and cater for just about any event here at the Inn. The ceremony was in a nice shaded area between the two main buildings under large oaks so everyone managed just fine with the warm temperatures. I napped through most of the wedding but I heard "Leigh" (that dog) was front and center while the couple took their vows. Thank you for giving me a brilliant idea. This one has a good shot!